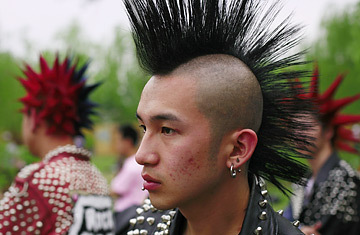 A punk fan watches a performance during the Midi Music Festival at the Haidian Park on May 2, 2007 in Beijing, China. A balmy summer night finds Ma Ziqi and a group of skateboarders weaving and flying around an open square in Beijing. Ma sets himself apart from the crowd, not only by his choice of wheels  he is the lone BMX rider  but by his skills. He pulls long wheelies, his front wheel far off the ground as he arcs around the rows of large flowerpots. He hops his bike, pivots it around, then starts riding again, standing up on the pedals and lazily making circles around the square, his ears filled with punk rock blasting through his headphones. Compared to the rest of Beijing, this square contains few obstacles for Ma and the skateboarders, just the flowerpots, floor lights, onlookers and trees in front of the ornate Wangfujing Church. As in other places, being punk in Beijing can mean many things. Ma doesn't even like to use the label, though he listens to punk music, played in a punk band and admits he has the punk spirit. The Beijing punk scene contains many of the same nuances it has in the countries from which it was imported. Jon Campbell, a promoter for rock bands in the Chinese capital, says that the city's punk culture today has grow into a layered subculture in which groups of people adhere to specific punk ideas such as the do-it-yourself spirit of making clothing and recordings. Some Chinese punks, says Campbell, even claim to be skinheads. "They know a lot about people like them around the world," says the promoter. And yet, as globally minded as they may be, the punks of Beijing still face the same limitations as their peers do on their lifestyles. Ma, 22, lives alone in a traditional Beijing home vacated by his family, who left for a more modern place. But for everything other than his biking, he is still financially dependent on his parents, like most of his companions. Only a few stores in Beijing sell skateboards and BMX bikes, and the punk music scene here is concentrated around a small number of clubs that sometimes have punk concerts. The church plaza where Ma rides is located on one of the most famous thoroughfares in central Beijing, Wangfujing Street. It is flanked by dozens of shops and restaurants. On summer nights, the lights are all on as people walk up and down the street, stopping to buy clothing, KFC chicken, jewelry, medicine, and anything else this consumer paradise has to offer. In many ways, Wangfujing represents the sort of consumerist bounty that punk culture rejects. It Also offers a venue for Ma to live out his anti-mainstream philosophy. As he sits on the steps in front of the church, watching his companions pull tricks on their skateboards, he says that what he and his companions do at the church square is "a symbol of youth and of living for yourself." "We're not like regular kids who study really hard in school and listen to what their parents want all the time," he says. "Maybe in other people's eyes we're not good, but we do what we want, and that's really the way to live life. People just don't understand." The punk scene here does grate heavily on modern Chinese society's expectations. Some punks drink and smoke marijuana, and the image they project is to many, as Campbell puts it, "a turnoff." The government doesn't approve of skateboarding and riding in public places because of the physical damage the kids cause. But its greatest drawback is something deeper: its anti-commercial philosophy. "In keeping themselves real, they've also marginalized themselves," says P.T. Black, a marketing consultant who follows trends in China. "People don't understand why you wouldn't want to be mainstream." Because consumerism is still quite new here, the true punk lifestyle, beyond the loud music and crazy hair, enjoys limited appeal. Even Ma will have to make his peace with the commercial world  a student of stage design, he plans to pursue a career outside his biking. "In this society," he says, "there's no way for me to live like this."